In this post I will show you how you can convert you SharePoint farm solutions (.wsp) to solution that works with Office365/cloud. 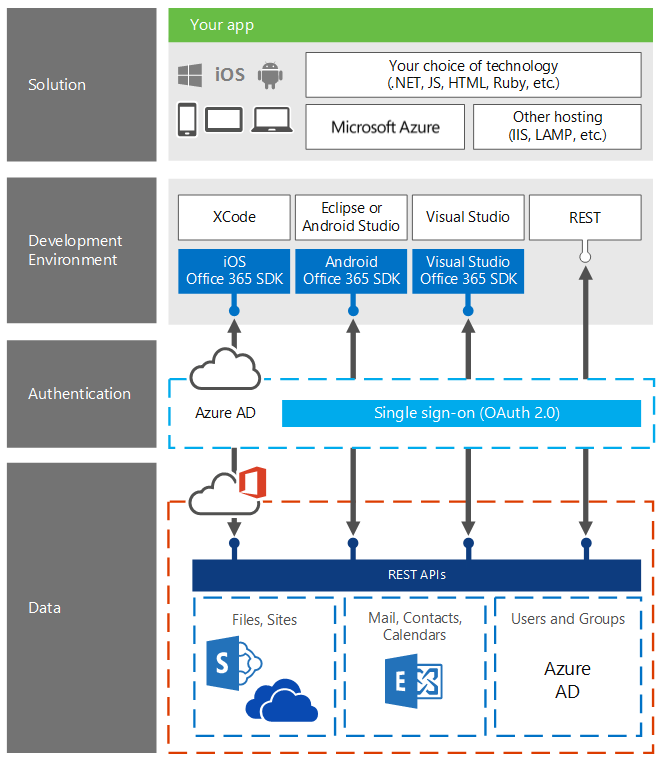 Picture copied from Microsoft Office365 Developer site. It looks like we have now more audiences (Developers) or we can say that we have more options to develop solutions that target Microsoft Office product. I will start with Console application that query SharePoint objects from On-Premise SharePoint farm as well as Office365. By doing this way we can prepare ourselves for cloud. Let’s start writing some code that works in both environment. //displaying title of the web. For on premise just set onCloud to false and rest of the code would be same for both environment. After executing it will show web site name and all lists within the site. Using this simple technique we can develop app-part, which I will blog soon, to show aggregated data from various lists in Office365. In next post, I will show you how we can leverage ASP.NET MVC application to host SharePoint CSOM code that will be used to create site definition and other stuff. That's it for now. Please leave your valuable feedback.